I don't do nearly enough with eggplant. It is such a versatile vegetable, yet I only cook with it every so often. As part of the VegNews Recipe Club, I recently received the recipe for Eggplant Rollatini out of the Forks Over Knives Cookbook and decided to make it. There were a bunch of errors and omissions in the recipe that VegNews sent out so I don't know if this was an issue due to VegNews' reprint or if it is just incorrect in the cookbook, but either way, I have corrected everything below in a version of the recipe that I think works well. After my modifications, it turned out to be an awesome dish! Imagine softly baked marinated eggplant wrapped around a savory filling of millet, onion, celery, carrot, and spinach and topped with a homemade garlicky tomato sauce. This is a recipe for success. Heat olive oil in a large saucepan over medium heat. Saute onions for 10 minutes. Add a bit of water if they stick to the pan. Add garlic, basil, and oregano and cook for another 3 minutes. Add tomatoes and salt and cook, covered, over medium-low heat for 25 minutes. Meanwhile, preheat the oven to 350-degrees. Slice the eggplants lengthwise into 1/2-inch slices and set aside. In a small bowl with a fork, mash 3 garlic cloves with soy sauce. Combine garlic mixture with vegetable stock to make a marinade. Place the eggplant slices onto a baking sheet and brush top side with some of the marinade using a pastry brush. I found that I needed 3 separate baking sheets for all of the eggplant. Bake for 10 minutes. Turn slices over, brush with more marinade and bake for another 10-15 minutes until the eggplant is tender. Remove eggplant from oven and set aside. Bring 3 cups of water to a boil and add millet and salt. Bring to a boil, then reduce the heat to medium and cook, covered, for 20 minutes. Heat 1 tablespoon of oil in a large saucepan over medium heat. Saute onion, celery, and carrot for 8 minutes. Add remaining 4 garlic cloves and cook for 3 minutes. Add spinach, basil, nutritional yeast, and black pepper. Cook until spinach is wilted, about 5 minutes. 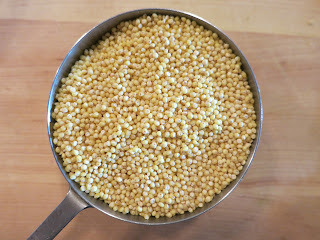 Add millet and cook 2 more minutes. In a 9 x 13-inch baking dish and another smaller dish, add enough tomato sauce to cover the bottom. Divide millet mixture between baked eggplant slices and roll each slice over the millet mixture. Place eggplant rolls, seam side down, in prepared pan. Cover with remaining tomato sauce and bake, covered, for 15 minutes. Serve warm. Great photos and very clear steps. However, the Forks Over Knives cookbook is specifically targeting those of us trying to cook with less oil and saturated fat, which is why their recipe used water as needed for the saute steps. Flavor is very close and saturated fat is much less. That part was not a typo on their part. Thanks for the info! I didn't get the recipe from that cookbook though. It was redistributed by VegNews and, as I mentioned, there were a bunch of errors and omissions. It wasn't just one thing. There was still a lot of errors in the recipe in FoverK cookbook. Such as when do you mix the spinach with the millet...does the tomato sauce go with the sautéed veg? I am so glad you published the fixes and your photos are great!